Discussion topic Christian news widget. Is there a better alternative to Christian News Widget? Is Christian News Widget really the best app in MP3 category? Will Christian News Widget work good on macOS 10.13.4? 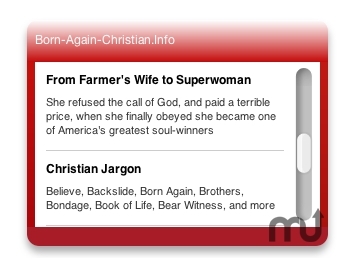 Born Again Christian News Widget is a Dashboard widget that displays daily rss feed from Born-Again-Christian.Info. Note: The views expressed in this widget are not necessary all the views of Jesus, nor MacUpdate, nor all of MacUpdate's community. Please rate the widget itself. Christian News Widget needs a rating. Be the first to rate this app and get the discussion started!